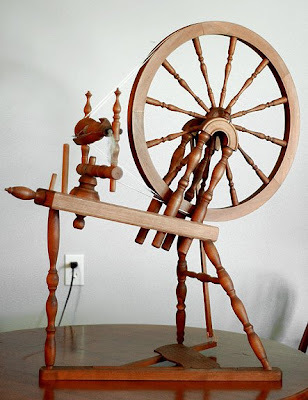 The Adventures of Cassie: Spinning Wheels! Yesterday I was given the amazingly generous gift of two saxony spinning wheels. The second wheel came in pieces, and was missing a few, but with a little improvisation and elbow grease, I've got it up and running. Both wheels still have a few kinks to work out, but I think I'll be able to have them fully functional with some more work. For now I've thoroughly cleaned and oiled both wheels, and have started to spin some lace weight singles on each one. 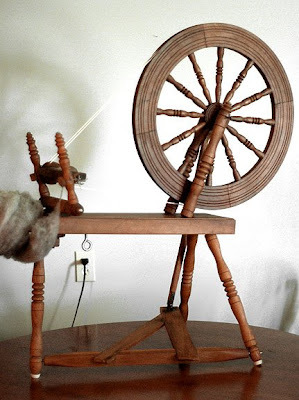 Having a saxony wheel along with my louet is wonderful because it spins lace weight yarn so much more efficiently than the louet which is better suited for spinning worsted weight and heavier yarn. Today I met the girls for some coffee and then did a little thrifting on my way home. I found this wonderful 3/4 sleeve cardigan from banana republic that still had it's tags on it (originally $60!) for $1. It fits perfectly, and I am a cardigan-a-holic, so I'm sure it will get lots of use. You can't see it in the picture, but it has pretty golden sheen. I also picked up these sandals, they are leather, and they were marked as my size, but I think they are a little on the small side. :( Maybe I'll stick them up in my Etsy Shop. I also picked up these lovelies. 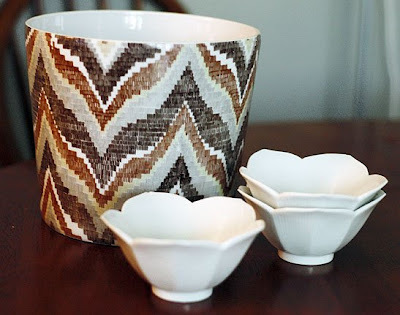 The large ceramic ikat planter was $1 and the lotus bowls were 50 cents each. It was a good thrifting day. Now I'm off to do less fun things such as cleaning my room so I can actually see the floor. What great finds! I can't believe that sweater was only a dollar! Hope they bring you similar happy memories. How did you get two wheels? Those spinning wheels are awesome! my mom used to have one but i never tried it out...you are probably gonna have some crafty fun with those! does this mean i have to start coming clean now too? glad you got such cool stuff. lets get together this week. Very nice wheels. That sweater is gorgeous. How is your neck doing? Hibou - You're welcome - hahah, I think the sweater is my new favorite! Carol - I got them because they were both in dire condition! 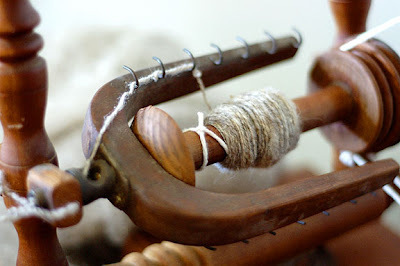 Lrc - You should try it sometime, even if you use a drop spindle - it is verrry relaxing. Cassie, I love to read your blog because you talk about your vegetables and your art projects and knitting and house projects and you have such lovely photography! It's nice that you talk about the good stuff.